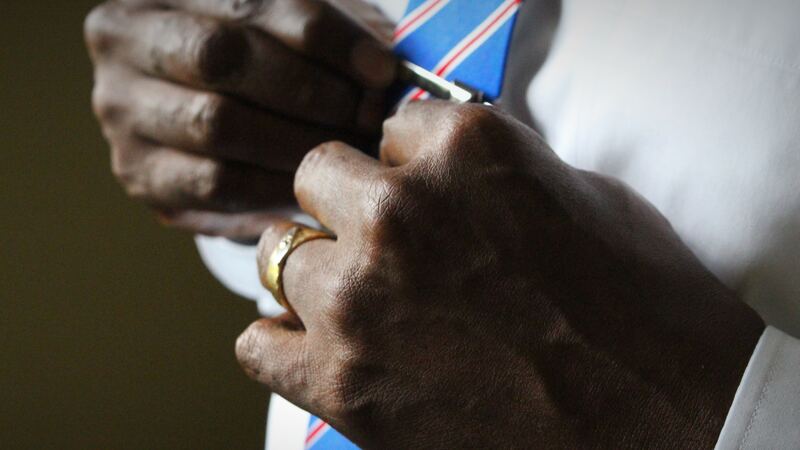 Who doesn’t love a great piece of neckwear? And if there’s one particular type we can’t have enough of, it’s definitely pendant necklaces. Pendant necklaces are the classic favorite of every female – dainty jewelry with just the right amount of sparkle. You can always find the perfect fit for any occasion, be it a blingy show-stealing pendant for an exclusive party or an understated gem to amp up your office wear. The most versatile of jewelry, you can never go wrong with a pendant necklace. Adored by every female in the world, pendant necklaces make for the best gifts. Birthdays, anniversaries, Christmas or just a token of appreciation – a sparkling pendant necklace is always in trend for any occasion. And because there is no end to how you can stylize your pendant necklace – layer it up or wear as a standalone – you know your gift will be getting a lot of use too. As for your budget, this is the beauty of a pendant necklace. While you can splurge for a necklace that catches your eye, you can also find a gem without breaking the bank. To help you buy the perfect pendant necklace, here’s our list of the top 10 pendant necklaces nobody can look away from. Beautiful and trendy, it’s impossible not to fall in love with these. If you find yourself drawn towards jewelry with inscriptions, this iSuri Crystal pendant necklace is a winner. There is a certain bewitching quality to this one, an entwined amber surrounded by a striking silver. The inscription on the circular border reads “The love of family is forever” as two hearts are engraved on the sides. A simple sentence, it reaffirms our love and faith in family. 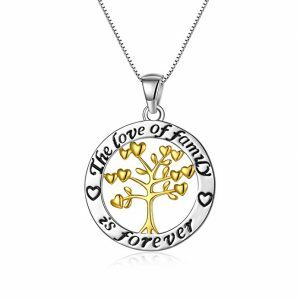 In the middle of the pendant, an amber tree stands proudly with branching hearts, symbolizing the power of family. This is a stunning pendant necklace with colors that captivate and simple artistry which speaks volumes. The necklace comes in a gorgeous gift box, ready to be presented to your loved ones. The chain is 18 inches long while the pendant adds 1.08 inches to it. A simple beauty, it slips in easily with any outfit and is very comfortable too. If you aren’t completely satisfied with the necklace, iSuri has a free 3-month warranty which you can avail. Finding a necklace which encapsulates the essence of family without going overboard is a rarity. This is why we think this is a great gift for members of your family whom you truly cherish. Mother, sisters, daughters – you can gift it to anyone or even all of them and don them together to Thanksgiving dinner. To celebrate the love of family and the ones we treasure the most, there could not be a sweeter way. For those who think pendant necklaces are simple delicate pieces without any fierceness to them, this Ancreu Angel Wing necklace will change their minds. 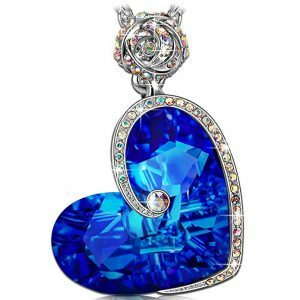 A fiery blue in the shape of a heart, it’s impossible to resist its magnetic pull. The heart-shaped pendant is encased with silver wings, studded with dozens of little Swarovski crystals which, when the light hits them right, sparkle just like diamonds. The blue with hints of the purple pendant itself has all the depth of an ocean and anybody who looks at it will have trouble looking away. Made from copper alloy and completely devoid of nickel and lead, this necklace passes the stringent Swiss SGS inspection standards with flying colors. Basically, this means you won’t be having any allergic reactions to it and it will last you much longer too. The length of the chain is 18 inches and can be adjusted 2 inches, more or less. The sparkling pendant itself is 0.96 inches wide and 0.9 inches long- just big enough to be the star of your look. This is a gift which sends a message straight to the heart. Perfect for close family members, friends or a romantic interest, this is sure to get any woman tonnes of compliments. No matter which outfit they choose to wear, this Angel Wings necklace will lend its magic of old world glamor. The healing power of birthstones and crystals don’t just set your life in order; they make for some truly precious gifts. This Tree of Life pendant necklace promises to lend its magical properties to the lucky wearer while bedazzling everyone else. 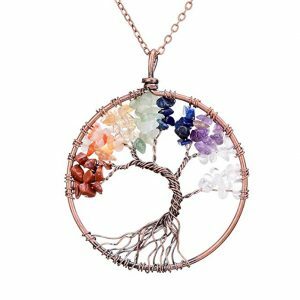 Set in entwined copper, the tree rises to present the 7 stones which can transform your life. Each stone works to set each of your 7 chakras in motion. What is a chakra, you ask? It is a Sanskrit word for the energy centers in your body. These chakras, or energy centers, when working in harmony, can bring great fortune which stems from your own mental, physical and emotional health. Curious as to what this Tree of Life pendant necklace holds for you? Here are the 7 stones used in the necklace and how they may impact you. The clear quartz, a translucent rocky stone, works to open the crown chakra, the top of the head. This will lead to better mental health and enhanced thought processing abilities. The next gem is amethyst in its rainbow of purples. Known as the “stone of the spirit”, this will ease the flow of energy in your brow chakra and thus, put your mind at ease too. The green aventurine is also called the “luck stone”. Representing the heart chakra, it works to mend any of the matters of the heart- relationship trouble or heart ailments. The red agate is all about the fiery root chakra. Besides easing the tension during stressful times, this stone is also helpful for digestive problems of the body. Lapis Lazuli, an ocean blue stone with golden specks, has always been a classic favorite and said to embody royalty and honor. Wearing it opens the throat chakra and empowers the wearer throughout all aspects of life. Redstone and citrine are the two last stones which work together in sync for smoothing the energy flow in the sacral and solar plexus chakra. In physical terms, they promote hormonal balance and metabolism while emotionally, they keep depression and social phobias at bay. When all these 7 stones come together, you know you are destined for greatness. The chain is 18 inches long with 0.99 inches adjustable. It comes in a small velvet pouch which only adds to the mystical detailing. For easy usage, there are lobster claw clasps at the back. If this is not the necklace that you wanted, Sedmart also has a no-risk return policy if you return the piece within 7 days. This necklace is the perfect gift for the bohemian princess in your life. And when the pieces in their life start falling into place, they will have you to thank for. A finely crafted teardrop pendant necklace trumps any bit of jewelry. 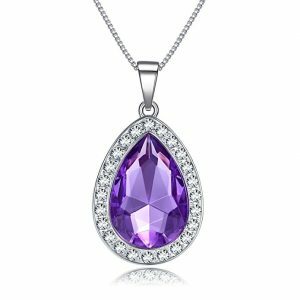 Universally loved and forever playful, the Vcmart amethyst necklace is all things we love about a classic teardrop jewel. The amethyst set in the pendant is a sparkling shade of lavender, breaking into bright shards as it catches the light. The stone is surrounded by glimmering crystals, upping the sparkles quotient by a few more notches. This is an exquisite piece of neckwear which every lady is sure to love. The length of the necklace is up to 19 inches while the pendant measures 1.7 inches x 1.1 inches. It is long enough to fall daintily over one’s neck and the pendant is large enough to grab everyone’s attention. The necklace is made from a copper alloy and is free from nickel and lead. There is a lobster claw clasp at the back to secure the necklace. Wondering who to gift this to? Well, if you’ve got a little one in your life, this necklace is specially designed for young girls who would love to wear some jewelry. The necklace has no sharp edges which often inadvertently cut children and it is made from high-grade material to prevent any sort of allergic reaction. And most importantly, it looks exactly like the Amulet of Avalor from the loved children’s cartoon, Sofia The First! The Amulet of Avalor is an ancient magical necklace belonging to Princess Sofia and has captured the imaginations of millions of little girls. The Vcmart teardrop necklace can easily pass off as its replica. It even comes in a little white box with a card which states that this is the famously charmed necklace belonging to Princess Sofia. This exquisite jewelry, straight from a child’s world of fantasy, is sure to make any little girl swoon with happiness. So, if you have a young girl in your life who will be dressing up as Princess Sofia this Halloween or just would just like to gift it to a sprightly child with a penchant for jewelry, there could not be a more perfect gift. And if you know an older lady who loves some bright jewels, they too can pull off this affordable teardrop necklace with élan. Looking to bedazzle the special lady in your life? The J. Nina Aphrodite Rose Heart necklace is an epitome of undying love. If you are proud of the love you cherish for your significant other and are looking to take things forward with her, this necklace is just the right gift to make sure your intentions are heard, loud and clear. Inspired heavily by the Heart of the Ocean diamond necklace featured in the Titanic movie, the designer of J. Nina decided to present their own unique take on the pendant. And believe us if you will, it is just as, if not more so, stunning. 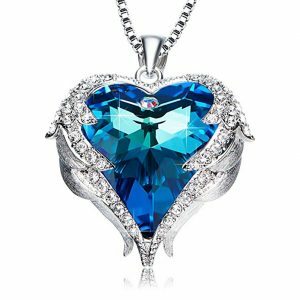 The pendant is carved in the shape of a heart and made from the crystal in the deepest of blues. It is studded with genuine Swarovski crystals on one half of its outer edge. As the heart-shaped pendant dangles, it rises at the top to form a delicate silver rose in half bloom. The rose too is studded with Swarovski crystals. These crystals used in the necklace are called Aurore Boreale, as they are an explosion of cosmic colors, just like in an aurora. Besides, these Swarovski crystals are a lesson in artistry as they are delicately placed throughout the pendant in a style known, in a jeweler’s lingo, as linear pavé. The beauty of this necklace does not end with just the front area. The back of the pendant features a hollowed rose design while at one of its sides stooping downwards, the words “I love you” are engraved – a simple declaration to be held close to one’s heart. This Aphrodite necklace from J. Nina is all about the details. Even the littlest details such the font of the inscription on the pendant evokes a romantic aura. To make your declaration of love even more official, the necklace comes in a beautiful deluxe box, embossed with the brand name. The length of the chain is 17 inches and can be extended to 2 inches more. The pendant is 1.5 inches long with a width of 1 inch. It is made of zinc alloy with no lead or nickel whatsoever. The necklace has also passed Swiss SGS inspection as a standard of its quality. In case you are less than a 100% satisfied with your Aphrodite necklace, they offer a money back guarantee. While it is a little bit on the expensive side, just take one look at the glimmering gem and it is all worth it. Exquisite and crafted with great care, the name of the necklace, Aphrodite, after the Greek goddess of love, certainly does it justice. For some of us, it is impossible to get through a day without our essential oils. What if you could carry your oil of choice with you throughout the day and do it with style too? The Azora Oil Diffuser necklace is a must-have for any lover of essential oils. If you thought it couldn’t get any better, boys can wear it too! 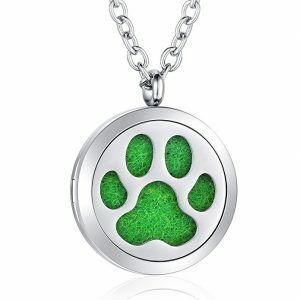 The pendant is a circular titanium cage with cutouts in the shape of a cute dog paw. Around felt pad is placed within the pendant; it is extremely absorbent, washable and best of all, it can be changed too. The pendant necklace comes along with 8 reusable felt pads in the following colors- pink, white, yellow, green, black, aqua, indigo and deep blue. Each of these pads can be used to over 6 times until its diffusing ability gradually decreases. In case the diffusing strength has truly worn down, simply wash the felt pad and it will be as good as new. Remember to use a dampened soft cloth with the tiniest amount of mild shampoo or detergent-free soap to clean the pad without damaging it. The healing touch of aromatherapy can get us through the worst of days. In fact, once you get hooked onto it, the lingering scent of various oils uplifts your spirits in no time. These oils each cater to different problems, serving different purposes. For instance, when you know the day is going to be long and stressful, a spritz of lavender can keep tension at bay. If you are prone to lethargy, the refreshing zest of peppermint will make sure your energy levels don’t drop. Rosemary, on the other hand, boosts your mental activity so you can solve the impossible. The list of uses of these various aromatherapy oils is endless. And needless to say, all of us need these at one time or another. With the Azora pendant necklace, you can switch up your essential oils along with the felt pads as per your need. Just open up the pendant using the side groove, slide in your preferred colored pad, spritz a few drops of oil and shut the pendant close again. Now, simply sling it on your neck and bask in the scent of the therapeutic oil, your very own talisman. The necklace comes in a 24-inch chain and is made of 316 stainless steel of the highest grade. It’s packaged in a beautiful gift box, complete with the logo of Azora, and a nice little pouch too. The pendant is held together by two strong magnets which, you can be assured, will not allow any drop of oil to spill onto your skin or clothes. In case there is a defect in the necklace or it is less than what you expected it to be, Azora also offers replacements or a refund, according to your preference. The Azora Oil Diffuser pendant necklace is a wonderful gift for anyone who loves healthy living and natural remedies. Cute, colorful and just a little whimsical, fans of aromatherapy will have trouble letting go of this. Even the diffused oil lasts up to two days while the necklace promises to last a lifetime. Healthy living has never looked so fun! Nina strikes again! Pendant necklaces do not always have to be light and dainty; they can be the showstopper of your look too. 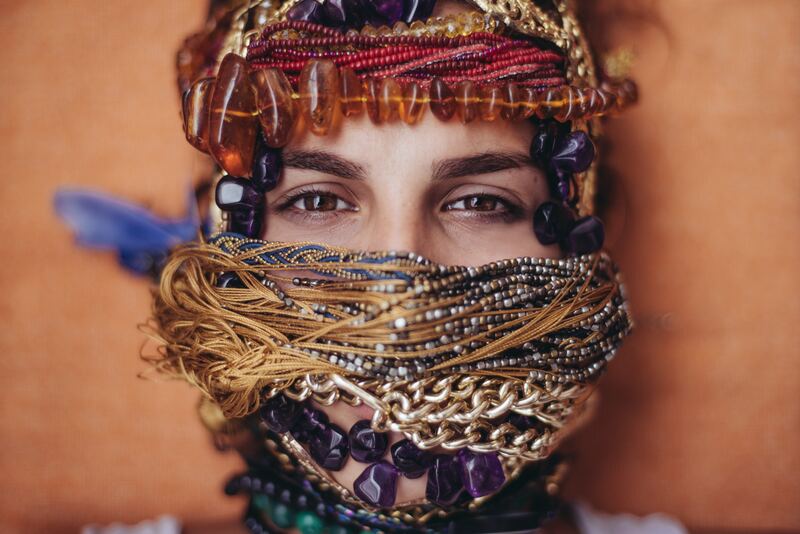 And J. Nina surely knows how to make pendant necklaces which steal the show. This one is special for young girls who are ready to dazzle. As children, we have all loved our Hello Kitty goodies. Who doesn’t remember a fully themed Hello Kitty set or a bedroom inundated with plush toys of the ever familiar kitty with a pink bow? And of course, when it came to fashion, Hello Kitty hairclips and pendants are quintessential of every 5-year-old girl. For the very same girl who is about to make the transition to becoming a lady, it’s time for an upgrade. 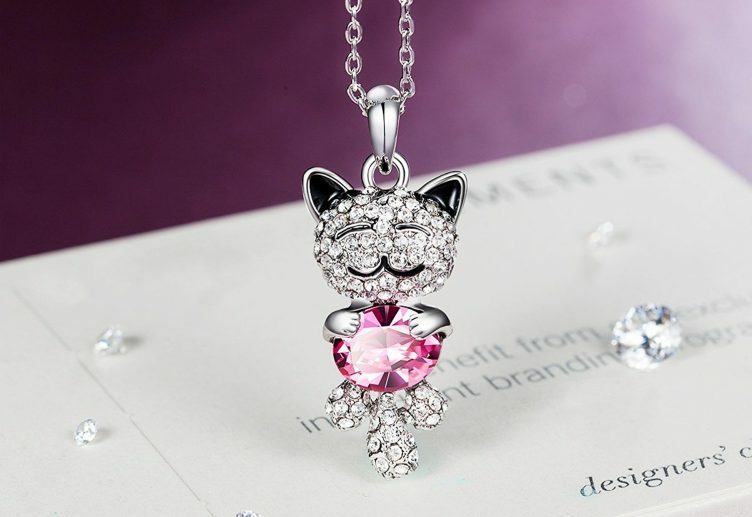 The J. Nina Lucky Cat Pendant features a Swarovski-studded, beaming cat- complete with pointy black years, a sweeping tail and adorable little paws. She’s christened Lovely Miss Kitty. And lovely she is! In her paws, she clutches a large rose-tinted Swarovski gem. It’s bright, sparkly and just when you thought it couldn’t be any more perfect, it has got mystical powers too. According to folklore, the pink gem attracts good fortune, love, and smiles along your way. No wonder the pendant looks absolutely magical! J. Nina has invested in story building and in a sea of one-dimensional jewelry for young children, the Lucky Cat pendant necklace is a breath of fresh air. In case you are already putting the necklace away to the children’s pile, hit pause for a while. Perhaps you are forgetting the feline lover in your life. In the age of the internet where cute cats are ruling every social platform, there is, none of us can resist going gaga over these adorable little devils. And among us, surely you know someone, perhaps a relative or colleague, whose life revolves around the feline kind! 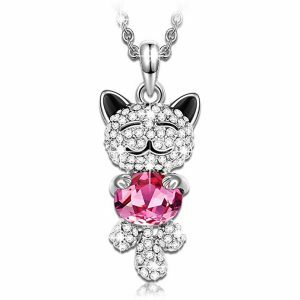 For those cat-o-holics, the Lucky Cat pendant necklace is a keepsake to be treasured for life. The chain is 18 inches long and can be adjusted by 2 inches. The length of the pendant, or as we call her, Lovely Miss Kitty, is 1.2 inches and the width is 0.6 inches. Lovely Miss Kitty here comes in a beautiful white hinged box, with soft lining and golden trim. It is lead and nickel free and has the usual J. Nina stamp of quality. A dazzling piece of jewelry, it will put a smile to anyone’s face. Gift it to a lady obsessed with cats and Hello Kitty or someone with a pink birthstone, and she will love you for it- for years to come. Even amongst all the sparkly stones, the world has to offer, it is impossible to outclass pearls. The Pearl Source is a show galore of strikingly beautiful, genuine pearls. And their Pearl Infinity pendant necklace is everything we love and more about the two of the classic jewelry favorites- pearls and pendants. The necklace features an infinity pendant atop which lies a beautiful lustrous freshwater pearl. An infinity pendant itself holds enormous significance. Generally, we take it to mean unity, eternity and everlasting love. But there are much more nuances to the symbol of infinity according to different cultures. For instance, in Celtic cultures, an infinity symbol or interlocked imagery of any sort presents the cycle of life; birth and rebirth of the soul and body. Egyptian hieroglyphics, on the other hand, use the infinity symbol i.e. the figure 8 flipped horizontally to express immortality. And in Tarot, it has numerous meanings including strength, the human spirit and the perpetual nature of energy. With so many powerful layers to a simple mathematical figure, it is no wonder every free-spirited person owns at least one jewelry piece featuring the enigmatic symbol. Add to the infinity loop a shiny pearl and you have a killer combination for dazzling beauty. Some of the most iconic looks of all time have a dash of pearl somewhere. Audrey Hepburn’s look, for example, in the movie Breakfast at Tiffany is an image imprinted into the minds of generations and more. The black and white poster of her gazing into the viewer’s eyes, her hair done up with a diamond tiara on top and a multi-tiered pearl necklace gracing her neck is one nobody who has seen it once can ever forget. Besides its power to transform looks, pearls are extremely meaningful too. Since the ancient times, pearls have been a symbol of wealth and prosperity with mystics believing that these gems can bring in good fortune. Pearls today stand for unparalleled elegance, playful innocence, and purity. When you are buying something as precious as a pearl, you should be buying the very best. Which is why we recommend The Pearl Source. Authentic freshwater pearls imported all the way from the mussels deep in the sparkling water of China- the quality, the glossy sheen and the uniform texture of the pearls speak for themselves. The Pearl Infinity pendant necklace of theirs also comes along with a Genuine Cultured Pearl Certificate, vouching for the authenticity and quality of the pearl. However, if you are, for some reason, disappointed with the purchase, you may turn to The Pearl Source’s 60-day return policy. The length of the chain is 17 inches while the pearl itself is 9mm. 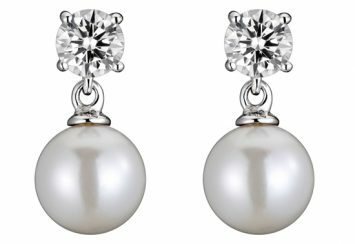 Just a tad bigger than most pearls out there, 9mm is the perfect size to add a heavier dimension to the pearl, for a more lustrous and elegant appearance. The chain is made of 0.925 sterling silver of the highest quality. The Pearl Infinity pendant necklace is just a bit more expensive than most pendant necklaces out there. But when your package arrives and you unwrap to find a luxury jewelry box within which lies an ethereal neckpiece, you will know it is completely worth it and more. 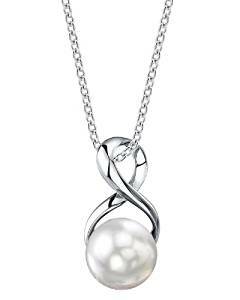 The Pearl Infinity Pendant necklace by The Pearl Source is a collision of two beautiful worlds and we love all of it. Save this otherworldly necklace for someone truly special, who will cherish this symbolic treasure and hold it close till eternity and beyond. No piece of jewelry is as intriguing as a beautiful pendant necklace with just a hint of the mystique. 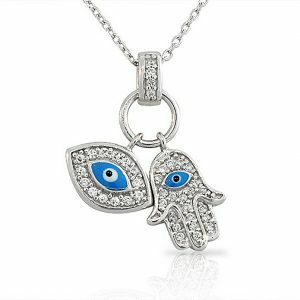 For the woman who is in tune with the universe and is unafraid to make a statement, the Evil Eye Hamsa pendant necklace by My Daily Styles is a staple in her jewelry box. An expression of the eclectic side which appeals to us all, it is an undeniably stylish way to steal the show. Made from 0.925 sterling silver, the necklace features two rings or loops onto which two pendants dangle. One of them is a blue eye, encrusted with glittering CZ or cubic zirconia stones on the sides. The other pendant is shaped like an open palm with five fingers, again with layers of CZ stones and a blue eye in the middle. In case you were wondering what CZ stones are, these are lab produced diamond simulants and they are quite good at what they do. Hard, crystalline and flawless, these brilliant stones even capture light just like diamonds for much less the price. Now for the pendants themselves, there is no way such a unique design wouldn’t have a rich backstory. And this one dates back to the ancient civilizations in the Middle Eastern subcontinent. These symbols are popularly known as the Hamsa with many other monikers such as Hand of Fatema, Hand of Maryam and the Humes Hand. Widespread particularly in the communities of Islamic and Jewish faith, many other cultures picked up on this fascinating emblem for what it represents. Although not rooted in any religious practice, the image of a blue eye, a hand and the number five is said to ward off the evil eye in Arab culture. The evil eye is basically the manifestation of other people’s spite and ill will towards us which can bring misfortune. Almost every house in the Middle East contains decorative Hamsas as protection against the malice of people. However, with the recent Arab Spring and uprising among Arab communities, the Hamsa has evolved to represent peace and harmony. The chain is 16 inches long and can be increased up to 18 inches. The dimensions of the pendant are 0.85 inches x 0.80 inches. 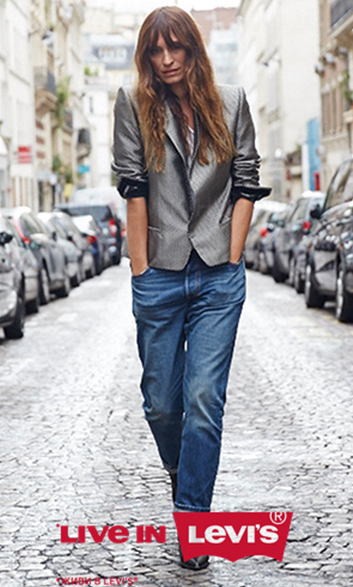 It is small enough to not completely overpower your look but just big enough to get compliments along your way. Being smaller and more comfortable than the average pendant, you can sleep with it too, ensuring you are never without protection from the evil eye. The Hamsa pendant necklace is more than just a gift. An affordable buy, it adds an esoteric quality to one’s very presence. For an admirer of world culture, tradition and all things mystical, this is a keepsake. Wouldn’t it be amazing to carry close to your heart the ones you love the most? With this stunning piece from AJ’s Collection, never again will you have to be apart from your family. Beautiful and personable, this is the ultimate gift for your loved ones. For the pendant, this necklace has 4 customizable disks and a heart charm on top to declare you’re bonded for life. The bottom disk is 1.25 inches and made of sterling silver, allowing 18 characters including spaces. Then you have a 1 inch rose-colored, gold plated disk which allows 16 characters. Next comes the 0.75-inch gold plated disk with 12 characters and lastly at the top, sterling silver makes an appearance again with 0.5-inch disk which allows 9 characters. You can choose what you want to be written on these disks, perhaps important anniversaries or the names of your family members, children and other close ones. You may also choose to leave the disks blank if you wish, because this necklace speaks for itself. The characters are deeply engraved onto the disks. Made from the highest quality material, this meaningful jewelry is sturdy yet lightweight. Clean it with dry polishing pads to keep it clean and shiny without damaging it. This piece is all about customization. You can even pick the chain type you want- box, ball or ball. AJ’s Collection also lets you choose the chain length although we suggest not to go any higher than 18 inches. The necklace is packaged in a recycled gift box, clean and simple, in an organza bag with a bow tie. 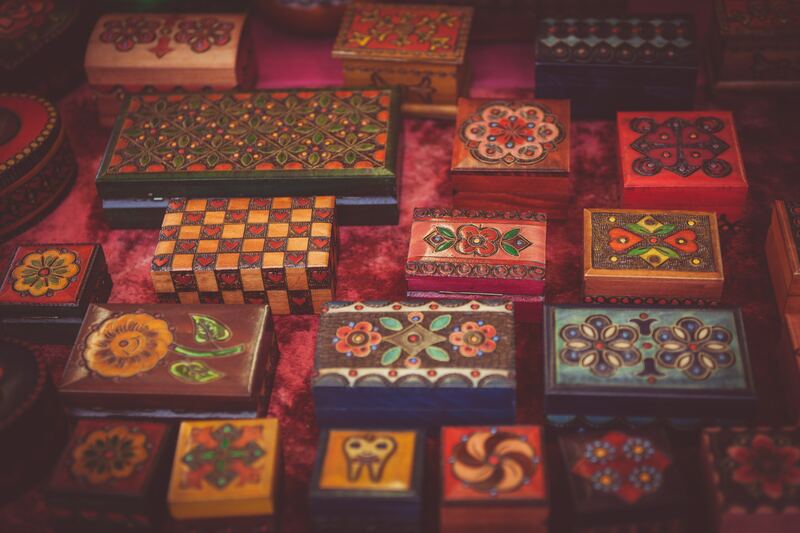 Although charming as is, you can also opt for a fancier gift box, complete with gift wrap. 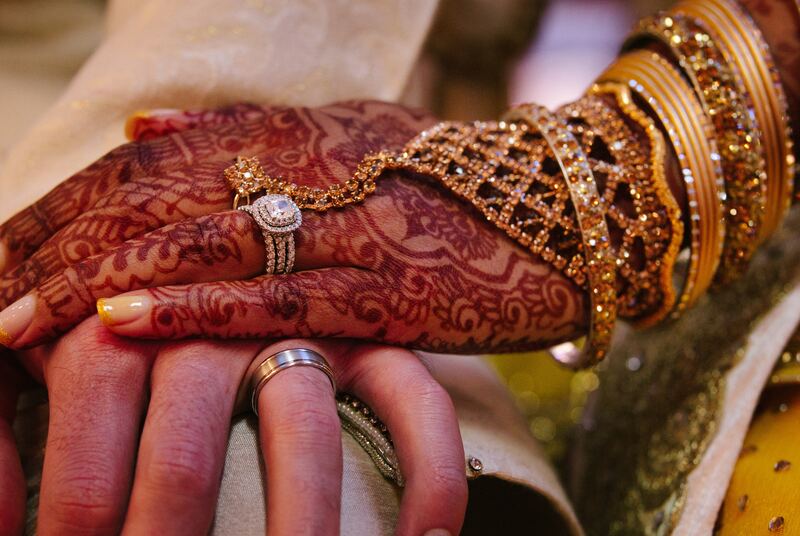 Nothing expresses love better than custom jewelry. 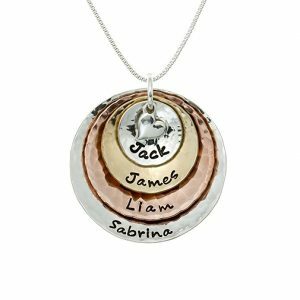 With loved names and memories emblazoned on to the necklace, this is the kind of jewelry people cherish for years to come. Going jewelry shopping is no easy feat and it certainly is not any easier when it comes to pendant necklaces. Here are some answers to the most common questions regarding pendants and jewels. Are pendants and charms the same? Answer: Yes, charms are smaller, daintier and more commonly seen on bracelets and anklets, although they can be added to necklaces. Pendants are larger, generally, have more embellishments such as rhinestones, and are exclusive to necklaces. What are the most common types of pendants? Answer: There really is no end as to types of pendants. Whatever it may be, as long as it can be attached to the chain, it classifies as a pendant. Medallion pendants, however, are very common, especially in heart shapes. Inscriptions too have always been popular particularly when it comes to gifts. Amulets and talismans, such as the Hamsa pendant necklace by My Daily Styles, no.9 on our list, are also often seen worn by both men and women. How do I choose pendant necklaces according to height and face shape? Answer: There are some general rules of thumb to apply here. While 18 inches necklace goes beautifully with most people of different heights, taller people can afford to wear longer pendant necklaces without it appearing to be clunky. It is also important to match the length of the necklace with the size of the pendant; a small pendant on a long necklace or the other way around looks somewhat out of place. Round faces should opt for longer necklaces to elongate their own facial structure. Narrow heart and diamond-shaped faces can go for shorter necklaces to soften their features. How should I clean a pendant necklace? Answer: This depends on the material of the pendant and the chain. 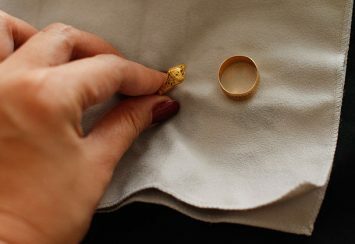 For sterling silver, a mixture of white vinegar and baking soda can get the heaviest of the tarnish off right away. 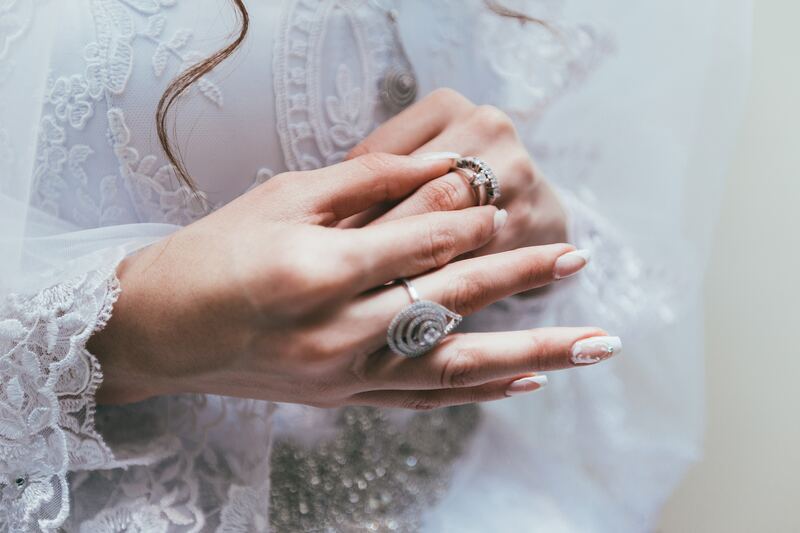 For Swarovski crystals, it is recommended to just use a piece of dry cloth and if it is really dirty, some mild detergent and lukewarm water ought to do the trick.